Home to the tallest peaks in Utah and covering more than 100 miles, the Uinta Mountains are a magnificent backdrop for year-round alpine recreation including hiking, fishing, biking and skiing. The Uintas run 100 miles east to west from Flaming Gorge to Kamas. Hike, backpack, and horseback ride in High Uinta Wilderness Area. Enjoy boating, fishing, swimming and water-skiing on the rivers and lakes. Cross-country ski, snowmobile, and snowshoe during winter. Enjoy spectacular views on Flaming Gorge or Mirror Lake Scenic Byways. The Uinta Mountains encompass a variety of unique and dramatic landscapes with open meadows full of wildflowers in summer and snow-crested slopes and peaks in winter. Here you can play amongst some of Utah’s tallest mountains and lose yourself in Wasatch or Ashley National Forests. 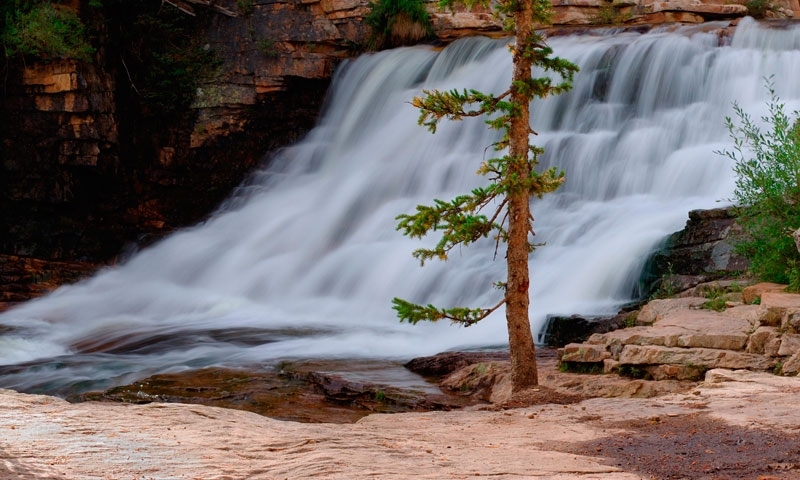 Leave motorized trappings behind and spend some peaceful time in High Uinta Wilderness Area or enjoy numerous year-round recreational activities including fishing, camping, hiking, cross-country skiing, snowmobiling and sight-seeing. The Uinta Range runs for 100 miles east to west just south of the Wyoming/Utah border from Flaming Gorge to Kamas, UT. You can access the Uinta Mountains from a variety of routes. Highway 150 traverses the western side of the range while Highway 191 traverses the eastern side. Season: Play in the Uinta Range year-round! Cost: Use fees and camping fees may apply depending upon the area. Hiking/Horseback Riding/Biking – Numerous trailheads intersect the Uintas, particularly near Highway 150. For some real seclusion, hike or horseback ride in High Uinta Wilderness Area but remember, no mechanized or motorized use allowed here. Camping - Camp in the valleys near open meadows, rivers and lakes or head up towards 13,000 feet and pitch your tent in the glorious backcountry. Off Highway Vehicle Riding - Bring or rent an ATV and cover vast amounts of ground on a thrilling ride through the Uintas. Be sure to check road and trail maps before heading out; some areas may be restricted. Fishing/Boating – Several blue-ribbon trout streams and large reservoirs full of trout, bass, perch and carp are located in the Uinta Range. Most reservoirs are open for power-boating and water-skiing as well as sailing, swimming, windsurfing and more. Golfing - Play a round of 18-holes at Dinaland Public Golf Course, located near Vernal. Cross-country Skiing/Snowshoeing – Grab some poles and glide or walk through the Uintas in wintertime for loads of exercise and relaxation in the cold air. Snowmobiling - Cruise down miles of groomed snowmobile trails or take your sled down old forest service roads or other areas open to sledding. Scenic Drives - Don't leave the Uintas without taking one of several unforgettable scenic drives through inspiring landscapes. Try the 40 mile (one-way) drive down Flaming Gorge Scenic Byway or pass several lakes and peaks on the 65-mile journey along Mirror Lake Scenic Byway. Hot Air Balloon Rides - Hot air balloon rides are popular in the Uintas and are a relatively quiet, clean, and exciting way to glimpse the beauty of this area. Very cool rock formation in southern Utah.